"“Cove Motel.....A Great Place To Stay” I you want a good clean ,conveniently located, very nice staff at a motel,this is the one... a great place to stay at a quality price. I will stay again and I'm looking forward to the next trip"
"“Just what we wanted” Close to everything along A1A and perfect for the car show at the speedway and Bellair Plaza. Plenty of places to eat and within a short ride to St Augustine. The office staff is wonderful and very accommodating especially Ginette. The sunrises were very nice from our third floor room." "I just check out today. This place was perfect for our girls trip. Every room has an awesome view. We enjoyed cooking our own meals daily. Kitchen was a plus overall. Hotel staff was very nice and kind. Not far from clubs and shops. My family and I will return really soon." "“Loved it” 5 of 5 stars Reviewed 2 days ago NEW We stay week of may 17 and we will be back!' Excellent customer service. Room immaculate, pool clean and blue. April at the front desk was a sweetheart. Yes renovating but they didnt bother us and we werent bothered by them. We enjoyed beach and pool, the view and nice quiet clean Stayed May 2015, traveled as a couple http://www.tripadvisor.com/ShowUserReviews-g34172-d281872-r278605985-Cove_Motel_Oceanfront-Daytona_Beach_Florida.html#"
"Vacation” 5 of 5 stars Reviewed 4 days ago NEW Nice motel friendly staff had a good time its got kitchen and the rooms where clean very good price and in the middle of every thing right out of the room on to the beach we went to Disney World why we was there just hour drive. Stayed June 2015, traveled with family 5 of 5 stars Value 5 of 5 stars Location 5 of 5 stars Service Was this review helpful? Yes http://www.tripadvisor.com/ShowUserReviews-g34172-d281872-r278136774-Cove_Motel_Oceanfront-Daytona_Beach_Florida.html#"
"THE COVE MOTEL HAS BEEN SUCH A WONDERFUL EXPERIENCE! THEY TRULLY HAVE DELIVERED! ROOM WAS CLEAN AND JUST ROOMY. THE STAFF WAS CURIOUS AND MADE OUR STAY VERY ENJOYABLE! WE COOKED OUT FOR LUNCH AND DINNER AT THE POOLSIDE. BETTER THAN ANY RESTAURANT EXPERIENCE! MY KIDS LOVE IT SO MUCH , THAT I AM LOOKING TO BOOK AGAIN VERY SOON!" "One of the few remaining beach motels of the '60's that has been refurbished rather than torn down. Very nice place with an efficiency room that we enjoyed. Quaint, yet modern and clean." "July 10, 2016 Cove Motel 1306 North Atlantic Avenue Daytona Beach, Florida 32118 RE: Mr. Romell Dear Sir/Madam: I am writing this letter to highly commend the above mentioned employee for his “EXCELLENT” Customer Service. His Customer Service was commendable. Coming from a servicing organization, I know how important Customer Service is and Romell Exceeded My Expectations. It was a pleasure speaking and interacting with him, and Romell is truly an ASSET to the Cove Motel, please thank him for me. My Hat’s Off to Romell and I will definitely recommend Cove Motel to all of my family and friends. Sincerely, Evelyn Eilets"
"Generations of memories at The Cove. Postcards for invites to return were such a special touch. We have been to many islands and vacations, but the most cherished times were at The Cove with family. We have been visiting there since early 1980's. Best Hotel on the entire beach! We hope to return, my mom and her 2 sisters are now in their 80's. They have so many cherished memories of our families spending time there. Now its almost 40 years later and we want to come back and make new memories, with the younger generation attending and hearing all of their stories together. Being at the age they are, this could possibly be their last cherished time together at the place they Cherished the most... 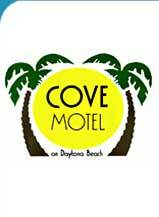 THE COVE ON DAYTONA BEACH...."
"Ett helt underbart Motel,bästa läge direkt på stranden,toppen rum vi hade rum med hörn balkong och kök,rent & snyggt bra personal vi återkommer nog igen"
"Super hotel nous sommes aller à cette hotel du 20 février au 2 mars et super ambiance j'ai aimé le tout au complet les journaux et café gratuit à tout les jours super propre autant intérieur quà l'extérieur rien n'est laissé au hasard à conseillé et c'est sure que nous allons y retourner merci pour ce beau séjour j'avais vu du négatif mais selon moi ce son du monde jaloux on a eu un problème d élévateurs et l'on réparer avec vitesse merci Mireille et Jean yves"
"thanks to all staff, George, Cat, Terta, Gena... it was perfect like every year...it's my second house"
"We had a great stay. The staff there were always right on top of any request you had. Clean , comfortable rooms and access right on the beach. Will be going back for another long term visit."